With its mines played out and the planet nearly stripped of its valuable ore, the Empire’s interest in Jabiim is waning. But Emperor Palpatine is not willing to allow Jabiimi rebels to forcibly boot the last of his stormtroopers off the planet. The harder they fight, the tighter the Imperial grip becomes. Help arrives in the form of the Rebel Alliance, which is hoping to convince the fiercely independent Jabiimi to join their galaxy-wide cause. But Rebel hero Luke Skywalker doesn’t realize he’s walking in his father’s tainted footsteps-or that the name “Skywalker” may earn him a death sentence from his would be allies! Luke, Leia, and their companions have been taken prisoner on Jabiim by the very Rebels they’ve come to help. Worse, the only people from whom they could expect any help-X-wing pilots Wedge Antilles and Hobbie Klivian-are up to their necks in trouble themselves. To top it off, an Imperial fleet is headed for the planet with orders to kill or capture everybody! Luke thinks he can find a way out of their current predicament if he can just figure out what it was that his father-Jedi hero Anakin Skywalker-did twenty years ago that caused this whole mess! Imperial Slave Ships are coming to take possession of the conquered population of Jabiim, and the only thing standing between them and the successful completion of their mission are two Rebel X-wing pilots. Hobbie Klivian and Wedge Antilles are in for the fight of their lives! On the planet Jabiim, Luke Skywalker’s situation has gone from bad to worse. Having managed an escape from the rebel group who wants revenge for his father’s actions during the Clone Wars, and having fought his way clear of the Imperial stormtroopers who are after any Rebel on which they can lay their hands, Luke ends up the captive of third party players. A group of wealthy Jabiimi have made a deal with the Empire: in exchange for their own freedom, they’re going to give the rest of the planet’s population to the Empire as slaves! Luke’s only hope lies with Leia and the droids-but they have problems of their own! It’s all part of an action-packed story that looks at some of the events from the Clone Wars in a new light! 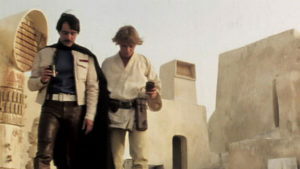 For the second time, events on Jabiim are coming to disastrous ends because of the presence of a Jedi named Skywalker. The first time was during the Clone Wars when young Anakin Skywalker was forced to abandon the Loyalist Jabiimi troops to the not-so-tender mercies of the Separatists. Now, Luke Skywalker, whose presence on the otherwise insignificant planet has attracted the attention of none other than Darth Vader, must decide whether to stay and fight and risk everything, or escape and leave the Jabiimi freedom fighters to face Vader’s wrath. But the choice may not be Luke’s alone-and no matter what he decides, Vader could end up with another prize that could doom the Rebel fleet!